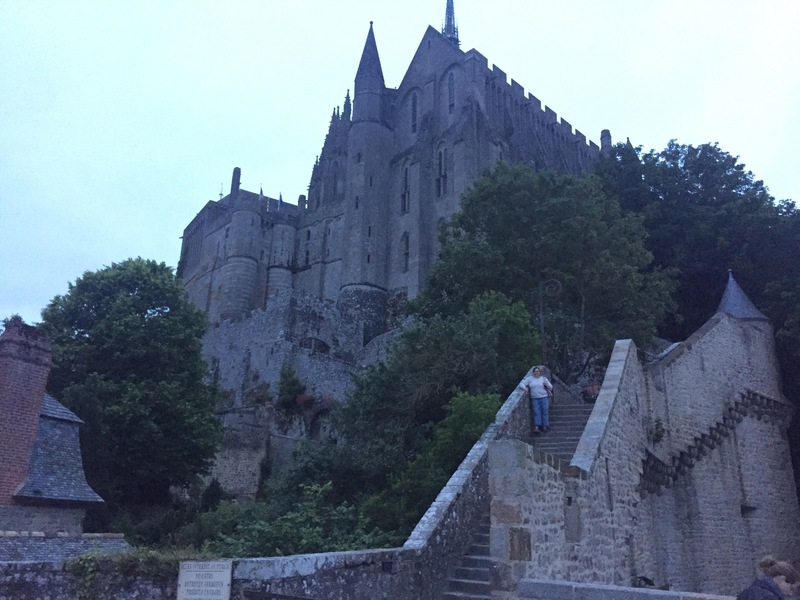 For anyone interested in medieval fortresses or beautiful seaside abbeys or even just impeccable French cuisine, Le Mont Saint-Michel in Normandy, France is an absolutely vital stop on your European or French holiday. This was exactly the mindset that we had when planning our week-long jaunt through France, this time having the courage to venture outside of Paris. Thankfully both my boyfriend and myself had just completed our fourth consecutive year studying higher level French making the lack of English speakers outside of Paris not as large of a concern as on previous trips. However, we did experience several hiccups as my mother had already made and paid for hotel reservations in the village close to the abbey, but we had no clue as to how we would get there. Due to some anxiety, we chose not to go through the process of renting a car in France, although I do believe that on our next trip we would most definitely do just that. While travelling using public transportation and taxis are freeing as you are not tied to any one car or a tour group, it does not take very much for difficulties to arise. Prior to our trip my mom browsed many a travel site looking for easy to follow directions on how to get to the abbey, but she had no such luck. My goal is to give those easy-to-follow directions that we never had the good fortune to stumble upon. This is how optimistic travelers might get themselves to the beautiful island and bay that is Le Mont Saint-Michel from Paris. Just for the record, while there are many fantastic day trips from Paris, this is not one of them. Plan to stay a night as the journey takes a good deal of time and you will want to get the most out of your trip to the abbey. From this train station, or gare in French (there are several gares in Paris so take care that you are at the correct one), take a train to Rennes. Once you arrive in Rennes you have two viable options. The train station at Rennes is currently under construction which does make things slightly more confusing. The first option you have is to take another train to Caen which will stop at a train station very close to your final destination. 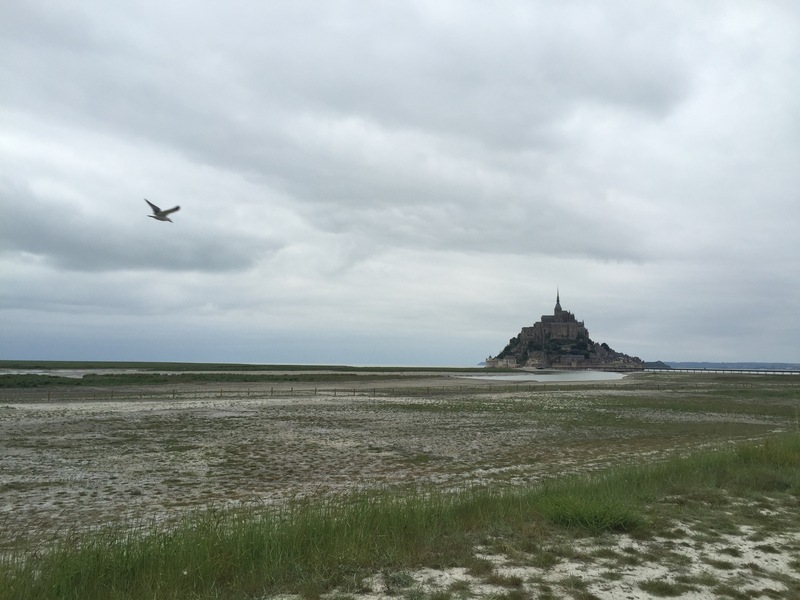 The second option you have is to take a bus from Rennes to Le Mont-Saint Michel. In order to do this you have to exit the train station and walk across the street (there are signs for you to follow if need be) to the bus station. Only a handful of buses leave each day so if you don’t arrive at a decent time in the morning, your chances are greatly diminished of finding a bus that day. The bus option did not work out for us because we arrived fairly late in the afternoon, so we returned to the train station. Further Directions for train to Caen from Rennes: proceed to a yellow kiosk that sells train tickets, here you can purchase however many tickets you need to Caen and check the times. You can buy tickets at the last minute for regional trains around Paris. However, you must be on the train at least 2 minutes prior to the posted departure time. General Note: Please note that if you are taking a Eurostar train to London or elsewhere out of Paris you have to plan for significantly more time since you will have to proceed through customs. You will disembark from this train at the stop for Pontorson/Mont St Michel and the train station will have this label clearly displayed when the train pulls up so it should be easy to make sure you don’t get off at the wrong place. From this train station in Pontorson there is a shuttle bus that runs regularly to Le Mont Saint-Michel. We arrived at this train station around 8 o’clock (20:00) and caught the very last shuttle of the night. Again, try your best not to travel too late as at a certain time the shuttles do stop running and you will have to call a cab which is not always as easy as it seems. *The bus driver is very very nice, but does not speak any English so be prepared with enough crude French vocabulary to confirm that you are on the right bus. This bus will drop you off in the little village area that is filled with a few hotels, shops, and restaurants all no more than a 2 kilometer walk from the abbey itself. Shuttles run from the hotel area to the abbey until midnight ever night of the week. 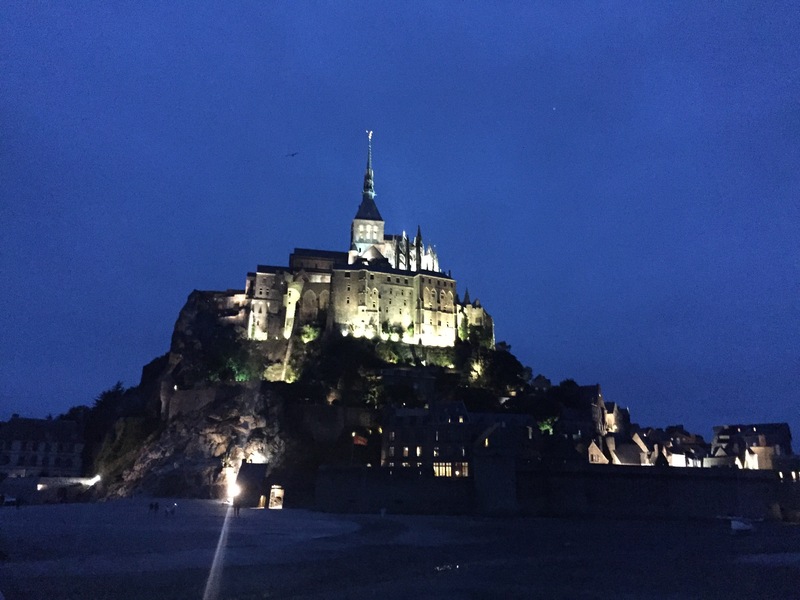 The huge benefit of arriving at our destination so late in the evening (we checked in at our hotel, L’Hôtel Mercure, around 8:30 pm) was that we were able to explore the abbey and its island late at night without the typical swarms of tourists. Please note carefully that all restaurants on and surrounding the island close by 9:30 pm and the walk from the hotels takes a decent amount of time. So, if you have not yet eaten take the time to get food before exploring. We had to resort to a collection of snacks we scavenged from the one vending machine on the island. If this is the case for you, I hope most sincerely that you enjoy chicken flavored potato chips or crisps. The abbey closes early in the evening, but the island is still open for exploration. If you have the ability to walk over to the island at night you should absolutely do it! It’s a once-in-a-lifetime opportunity. The smell of salt is carried through the wind as seagulls constantly cry out, and it isn’t hard to be transported to a different world. We chose to walk over to the island rather than take the shuttle despite the rain. Also note: if you are planning a trip to Normandy please bring a sturdy umbrella and a rain jacket. You will need them. On the walk over one can see herds of sheep in the distance and rabbits hoping along the shore. It’s a truly amazing sight to see the Abbey rising in the distance. Despite the difficulties that we encountered, the journey was entirely worth the marvel of the destination and I would absolutely recommend making the trek for anyone interested. Thank you SO much for this post!! My 20-something daughter and I traveled from Paris to Mont St Michel using your instructions and it was a piece of cake! We also chose to travel at around the same times you did (though arrived a little earlier in the evening) in order to see it both at night and during the day–spectacular! Thanks for making it seem so easy–it was a fabulous side trip before we went on to Barcelona!